Look up the data for the unused color powers. Search for more unsued voice lines. 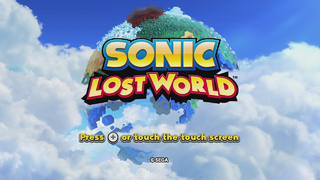 Sonic Lost World is the result of a high-speed collision between Sonic Colors and Super Mario 3D World with a pinch of Super Mario Galaxy,Super Mario 3D Land. Unfortunately, it doesn't really work. However, it does resemble an older entity in the series that never quite made it. A rather melancholy-sounding item fanfare is included alongside the other four variants, located in sound/se_system_worldmap.acb, with the internal filename sys_jingle_release_ng. The "ng" is a common abbreviation for "no good". Replace this YouTube video with direct audio rips. Eggman has some voice lines that weren't used in the Wii U/PC Version. Apparently, some were used for the 3DS version. Found in CommonObject. Most objects seem to be leftovers from Sonic Generations and Sonic Colors. They use the older version of the .model format seen in Sonic Unleashed and Generations, and all of which have the "_HD" suffix seen primarily in Generations. There is unused data present in the game files for the Blue Cube and Pink Spikes Color Powers, as well as an unused Snake transformation. While this is possible in Windy Hill Act 2, on the puddle near the start (the only time Sonic interacts with water in his regular form), this still doesn't appear. A LUA script in the root of the game's directory, complete with an author name and what looks to be developer notes. "drill" Is the internal name for the yellow drill wisp in Lost World as in Sonic Colors it's "spin","rodeo" is the internal name for the purple frenzy wisp,"astro" is for the green hover wisp and "puzzle" is for the blue cube wisp.Interestingly the pink spike, purple frenzy and blue cube wisps were originally going to be in Lost World. A pretty nice thing to have if one wanted to see how the mission system worked in Lost World. After completing all missions, Omochao informs the player that he/she has earned a reward, but nothing happens. In the PC version, this was changed to a simple congratulatory message that doesn't allude to any award. The game's digital manual is filled with strange issues that vary depending on the language. The "Game Screen" section is duplicated on pg.10-11, and "Circus" on pg.16-17. The "Color Powers" page is completely missing, although it's supposed to be pg.15 according to links. Pg.15 is instead "Advanced Actions". The "Color Powers" page does exist, but it's on pg.16, not 15. The erroneous link to it remains. This significant patch altered many gameplay elements. Collecting 100 rings now grants the player an extra life. After a Game Over, Sonic starts with 10 lives instead of 5. The Indigo Asteroid, Crimson Eagle, Orange Rocket, and Black Bomb color powers can now be controlled using the analog stick and buttons in addition to the gyroscope. Items appear randomly on blank spaces on the world map. Fixes the flickering glitch in the Frozen Factory casino area. After completing the NiGHTMARE DLC, players are notified that they can re-access it after scoring 100,000 points. Adds support for additional DLC, such as the Yoshi's Island DLC. Adds support for The Legend of Zelda DLC. This page was last modified on 21 April 2019, at 05:42.